PDF or Portable Document Format is the defacto format that is used to send documents across the world. It’s popular because there is no direct way to edit the documents. The chance for anybody to tamper with the files reduces as well. However, sometimes it becomes an essential existing PDF because the source is lost. In this post, we are taking a look at iLovePDF which is an online PDF editor. Based out of Barcelona, the team has been offering and improving its PDF tools for over a decade now. They have a lot of tools in their platform. Consumers can use them to edit PDF online, and then export it out in some of the most popular formats. Organize, Rotate, add page number, watermark. Convert to PDF from Word, Powerpoint, Excel and vice versa. PDF to JPG and vice versa. One of the significant advantages of using this Online PDF editor is that it is easy to use and navigate around. Lets deep dive into their interface, and how you can use it daily. Just before we start, let’s get one thing clear. It is not a full-fledged PDF editor platform. So do not expect to edit text, copy images, or add a new page, etc. Once you log-in to the website, you get access to all the tools available. Taking Merge PDF as an option, click on it, and you can add files from your computer, Dropbox and Google Drive. Once you add them, then you can rearrange them using drag and drop. Remember you cannot change page numbers here or change the order of pages inside a PDF. You merge them as one PDF file. When it comes to editing a PDF file, you have a couple of options. and lastly, add watermark to it. I loved the fact that whatever they offer is completely customizable. You can choose default or use Page n of x or have your format. Another useful feature in their tools arsenal is an option to fix corrupt PDF file. Depending on how much the PDF is damaged, the software will be able to recover it partially or completely. Once it fixes the corruption, you can choose to compress the PDF using their in-house tool. It will reduce file size while optimizing for maximal PDF quality. When it comes to security, you have two tools. First lets you lock your PDF files and then share with others. The second allows you to unlock password protected files. That said there is one small drawback. While performing any of these operations, except for editing tools, there is no option to zoom into the PDF files. It makes it difficult to judge, especially when you want to export files. I hope this can be rolled with time. The online PDF editor not only supports 25 languages across their platforms, but it also offers multiple types of plans and pricing. It makes sure that even if you do not have enough budget, you can still use the essential functions with the Free Plan. Those who are up for professional work, they offer Premium and Premium Pro plans. So how do the plans differ? It’s interesting. Every plan has its own limit of file size and how many files you can use per task. So if you want to merge PDF files under free plan, you can use 25 files. Premium and Premium Pro allow 200 files per task. So if you are using their free plan, you can process any numbers of files, but during a certain period of time. The ILovePDf team has also made sure that every plan has access to their tools or tasks. There are limitations, but you get to use all of them. That said, the Premium & Premium pro accounts do have some advantages. You will get access to OCR technology & in Premium Pro you will able to gives access to desktop application with all features and highest limits. It can read text from the documents which contains images and drawings. It makes it possible to search for text inside it. You can convert to Word as well. Premium & Premium Pro users can manage their teams as well. As many PDF editors are also used for Business, the tool here complies with GDPR. All files are removed from the server after processing. 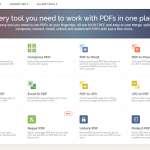 Overall iLovePDF offers an excellent suite of tools for editing, and managing PDF files, You can use these tools to convert files, add watermark, remove pages, and so on. It also has OCR technology which makes sure that the drawings and text inside them can be searched. It makes it practical for the business case. What do you think of this online PDF editing tool? Let us know in the comments.